Please note: The manufacturer of Cubbies does not recommend that Cubbies be used for anything except embroidery. This was an experiment that an EnMart customer did that we wanted to share with you. We have long maintained that Cubbies are about a lot more than just birth announcements and can be decorated in a variety of ways, some of which don’t involve thread. Today we’re going to prove that to you, by featuring a Cream Dumble, decorated by Brandi Womack of MommaWombatCreations. This adorable little guy is decorated with both rhinestones and vinyl. Best of all, Brandi provided us with some hints and tips on how you can create your own decorated Dumble or other Cubbie, using these materials. The infinity heart was a design that Brandi created herself, because she couldn’t find an existing design that she liked. At first the heart and the infinity symbol were intended to both be vinyl, but Brandi decided to add a little bling to the design by creating the infinity symbol from rhinestones instead. Templates were created using a Silhouette Cameo. Sticky flock with hotflex tape was used for the rhinestone template. The vinyl is Siser Easyweed. The vinyl was pressed to the ear using a heat press set at 310 degrees. It only needed to be tacked in place, so it was only pressed for a few seconds. The rhinestones required that the temperature on the heat press be bumped up to 325 degrees and required a press time of 25 seconds. 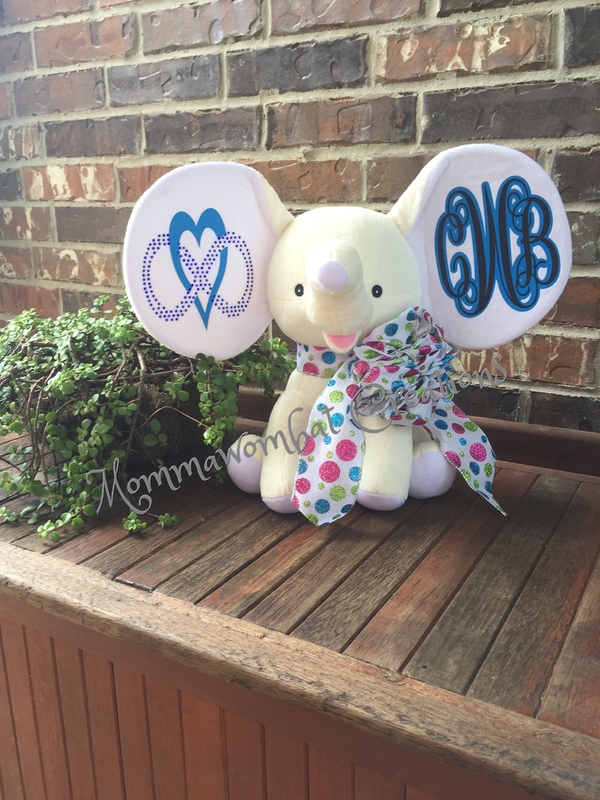 The other ear has a vinyl monogram featuring the initials of both Brandi and her husband.It was created offset in two layers. It was pressed at 310 degrees to tack it into place and then pressed for a full 22 seconds to secure it to the Dumble. Please keep in mind that pressing temperatures will vary based on the type of vinyl used for the project. Finally, Brandi added the jaunty bow around Mr. Dumble’s neck as the finishing touch. The bow was created using ribbon and floral wire. The first step was to fold the ribbon end over end and then twisting floral wire around the middle of the folded ribbon to hold the bundle together. Then the ribbon was fluffed until it achieved the desired fullness. After that, a longer piece was cut to go around the Dumble’s neck, using a noose like loop. Additional floral wire secured the bow to the loop for the neck. The wire was trimmed as short as it could be to match the length of the ribbons. Once the wire was trimmed, the bow was slipped over the neck, and the ends of the ribbon were trimmed to a length that suited the size of the Dumble. This is a great design for an anniversary or wedding gift, and would be a treasured memento for any couple. It also goes to show that vinyl and rhinestones can be an elegant way to decorate a Cubbie. To see more of Brandi Womack’s work, visit MommaWombatCreations on Facebook.